In 1565 the previous queen of the Mughal Dynasty, Haji Begum, ordered the construction of the largest and the most splendid mausoleum in the empire for her late ill-fated husband, Humayun, near to the Yamuna River. This mausoleum, which would later have a great influence upon the Taj Mahal, was principally based on Persian architectural vocabularies, but was cleverly Indianized. The surrounding garden was also the first prodigious materialization of the form of the Persian ‘Chahar Bagh’ (Quartered Garden) in India. This mausoleum is the best representative monument in the Indian capital of the past authority of the Mughal Empire. Later, after the Indian Mutiny, this mausoleum would symbolize the end of the declining Mughal Empire; and the last emperor would be captured in this edifice. Literary emperor Babur (r.1526-30) from Central Asia established the Mughal Dynasty, which would become a great empire. His son Humayun (r. 1530-40, 1555-56) succeeded him as the second emperor in 1530, but was not so competent a ruler. With his love of poetry and wine, he did not necessarily show his skill in the way of politics and military affairs. Ten years after his accession to the throne, his authority as an emperor had been lost almost entirely. In 1540, a governor of Bihar in eastern India raised a rebellion declaring the independence of his territory. After two victories over the Mughals, The governor, now adopting the name of Sher Shah, established the Sur Dynasty. After fleeing to Persia, Humayun came back to India 15 years later with the assistance of a huge Persian army, defeating the Surs, and reconstructed his Mughal Empire in 1555. On his return from Persia, he brought a lot of scholars, officers, artists, and craftsmen with him to India. However, the period during which this unfortunate emperor could enjoy his reinstatement was quite short, because he died suddenly in January 1556 by falling down the stairs in his court library. West Gate to "Chahar Bagh"
The queen of Humayun, Haj Begum, also called Bega Begum, grieved so deeply over her husband’s death that she dedicated her life thenceforth to a sole purpose: the construction of the most magnificent mausoleum in the empire, at a site near the Yamuna River in Delhi for the memorial of the late emperor. Under the command of the Persian architect, Mirak Mirza Ghiyath, the construction of the mausoleum with utmost luxury was completed 9 years after the emperor’s death, but other accounts suggest that it commenced 9 years after the emperor’s death and was completed in the 14th year of the reign of his successor Akbar (r.1556-1605). This first colossal monumental mausoleum in Islamic India can be considered an early masterpiece that was to decisively influence the design of the later Taj Mahal, the high point of Mughal architecture. The Islamic dynasties that rose in succession in Delhi before the Mughal Dynasty are called the ‘Delhi Sultanate,’ among which the Lodi dynasty developed tomb architecture. In contrast, the mausoleum of Humayun, the first great work of the Mughal Dynasty, swept away the previous Indian traditional methods of column and beam structure and brackets supporting eaves, making its whole figure simple and geometric by repeating Islamic pointed arches everywhere. It generated greatly refined form instead of the rustic impression seen on the mausoleums in the age of the Delhi Sultanate. The façade, though previously quite plain and bony, gained in Humayun’s Tomb a brilliant effect by interlacing white marble with red sandstone and being crowned with a large shining dome of white marble. Craftsmen also adopted the technique of Persian inlaid work. In Persia, as architects could not gain good quality stone, they used bricks as the main construction material and covered them with tiles or stones, while in the wealthy Mughal Empire, architects could use abundant natural stone and carry out fine inlaid work on them. In other words, the development of building technique through 350 years of the Delhi Sultanate since the Quwwat-al-Islam Mosque had almost reached the stage of completion in Humayun’s mausoleum of the Mughal Dynasty. 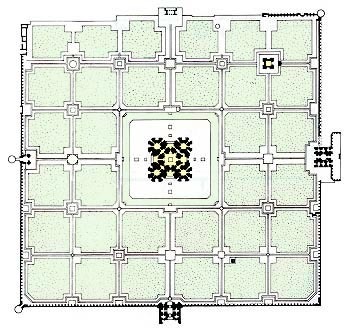 PLAN of Mausoleum of Humayun and its "Chahar Bagh"
The tomb of Humayun is set in the center of a grand square garden, which is divided into four quarters by waterways and each quarter is also divided into nine (usually four) small squares. This purely geometrically-shaped garden originated in Persia, and is called ‘Chahar Bagh’ in Persian and ‘Charbagh’ in Urdu, meaning ‘four gardens’ or ‘quartered garden.’ Its first gigantic fruition in India is Humayun’s tomb-garden in Delhi. The Quartered Garden connotes fundamentally an idea of paradise. For Islam, born in a desert region, a garden surrounded by walls and providing cool shade and ample flowing water was an earthly reproduction of the celestial paradise. Based on this principle, the Mughal Dynasty would thereafter create many superb ‘Mughal gardens’ for important mausoleums. Buildings and gardens formed an inseparable relationship. A corner of enormous "Chahar Bagh"
The sarcophagus of Humayun is laid in the central tomb-hall of the Persian style mausoleum standing in the center of the great Charbagh. The edifice itself stands on a high podium of 90m square with four square tomb-rooms surrounding diagonally the central tomb-hall. As those rooms are cut off on each corner, the entire plan can be seen as an assemblage of five octagonal buildings. The whole edifice is made completely geometric on a plan with point symmetry. The four sides of the edifice are made in the same figure, each of which is composed of three large arches. Under the largest central arch is a half outside space covered with a half dome, which is called ‘Iwan’ in Persian. Though in a Persian type mosque, four Iwans face each other around a courtyard, here in the mausoleum of Humayun, four Iwans are facing in opposite directions with a central dome instead of a courtyard, making the whole edifice a sculptural work. This is a device applied to Indians who are fond of sculpture more than any other genres in the formative arts. The central dome at a height of 38m is a double- shell dome of a central Asian type and the outer dome, forming the roof, is covered with white marble. Umbrella-shaped Chhatris (small turrets) supported by columns stand around the main dome on the roof and give an Indian impression. The inner dome, 12m under the outer dome, makes a favorable ceiling height for a volume of three floors for the central tomb hall, which serves a pivoting role connecting itself with surrounding rooms and four Iwans. It is said that about 150 dead persons were buried in this mausoleum; emperor Humayun, his queen Haj Begum, Prince Dara Shikoh, and high-ranking courtier, though the disposition of their coffins is not known exactly. In the age of their rule, Indian Islamic architecture indeed attained to its apogee. Under the rule of Akbar, in which this mausoleum was completed, the state of Delhi as a city of arts was established. However, this emperor, known for his strict policy of austerity, made the interior decoration of this mausoleum simple and modest. The central dome has hardly any ornamentation; rather the small dome of the antechamber is decorated more. Although Humayun’s tomb is a masterpiece in early Mughal style, it also symbolized the empire’s most unhappy epoch. In 1857, on the occasion of the mutiny of Sipahis (sepoys), the mercenary troops of the British army, the last Mughal emperor Bahadur Shah II (r.1837-58), who had committed himself to the rebellion, took refuge to this mausoleum with his three princes. After the mutiny was suppressed by Captain William Hudson, the emperor was arrested near Humayun’s coffin. He was deprived of his imperial throne and exiled to Myanmar (Burma), supplied with a pension for life.